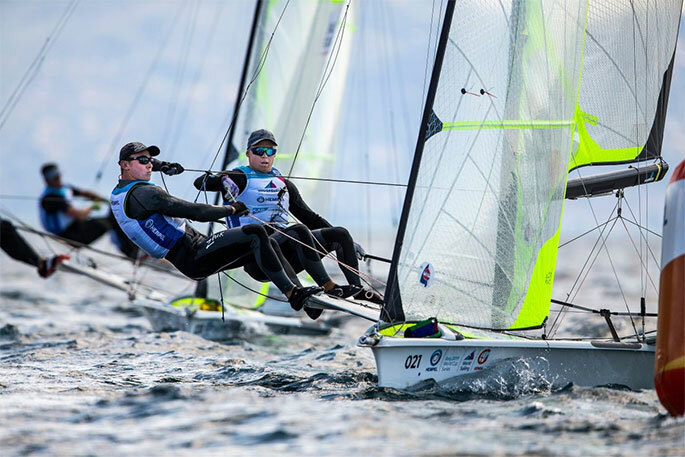 Isaac McHardie and William McKenzie are second in the 49er after the first day of the World Cup Series regatta in Genoa. Photo: Sailing Energy / World Sailing. The pair are second in the 49er after the first day of racing in the Hempel World Cup Series regatta in Genoa after winning their first race and finishing second in the other. 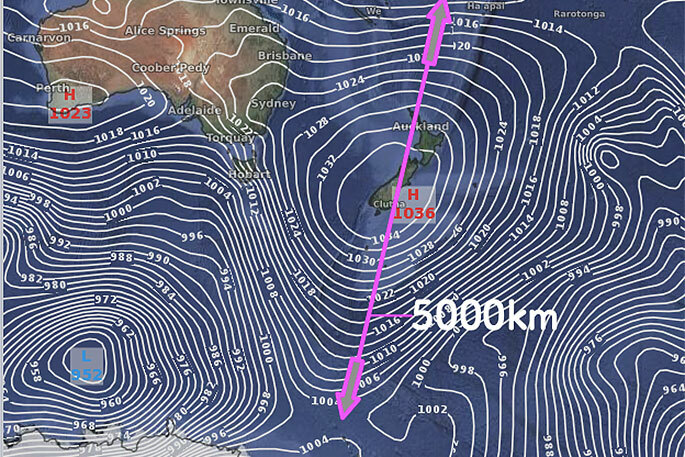 The rest of the New Zealand 49er sailors had mixed results in the light conditions, with Josh Porebski and Trent Rippey 14th, Peter Burling and Blair Tuke 31st and Logan Dunning Beck and Oscar Gunn 59th, but the scorecard is likely to change drastically over coming days with light winds forecast throughout the regatta. All three crews came into the Genoa event on the back of finishing in the top 10 at the Princess Sofia Regatta in Palma. Alex Maloney and Molly Meech, who have finished second in their last two regattas, were third and 15th in their two races in the 49erFX and are 14th overall. Gemma Jones and Jason Saunders were the only other Kiwis in action overnight (NZ time) and backed up a start line disqualification in their first race by winning the second. They are officially 40th equal overall but the pair were protesting their disqualification, arguing the buoy at the pin end was moving in the current at the start of their race. "A UFD [disqualification] is not ideal for this regatta because there's probably not going to be as many races as scheduled due to the weather conditions being light," says Jones. "We backed ourselves a lot more [in the second race] and sailed less conservatively and went for it. It's kind of the conditions where you had to do that." It was a funky kind of day off Genoa, and the 49er fleet sailed one race in a 12-knot shifty offshore breeze and the second in a light six-knot sea breeze. It's unlikely to get any easier throughout the regatta so teams will be scrapping for every point with the prospect of big scores hanging over them. McHardie and McKenzie read the conditions well to bank two good scores and are second in the 49er after day one, one point behind the German pairing of Tim Fischer and Fabian Graf who made the perfect start with two race wins (the 65-strong 49er fleet is split into two groups for qualifying). "Today was very interesting with two completely different races," says McKenzie. "Isaac and I focused on staying in the pressure and slowly chipping away in the first race and managed to sneak into first place right on the finish line after a hectic final downwind run. "We kept the second race simple and sailed fast to score ourselves a solid second place. With four more days of racing to come we still have everything to play for and are both looking forward to giving it our best shot." McHardie, 21, and McKenzie, 22, are members of Yachting New Zealand's Aon Fast Track programme, which aims to accelerate the development of potential Olympians, and won last year's Red Bull Foiling Generation world title. More New Zealanders will be in action tonight, with competition in the men's and women's 470 and Laser Radial getting under way on top of the Laser and Finn.